Many teachers have trouble making social studies interesting because they don’t understand or like the subject themselves. There’s good news: we all have personal limitations, and they DON’T have to affect our students. On this page, you’ll learn how to get students passionate about social studies even when you have limited time, resources, or background information. It’s not– the way it’s traditionally been taught is boring. Didn’t you hate history class when you were in school, memorizing all those meaningless dates and names and places? At the beginning of the school year, not one of my students typically names social studies as his/her favorite subject, and most kids don’t even understand what the subject is about. That breaks my heart, because history is all about studying the things that people were passionate enough to fight for and change. Social studies instruction should challenge students to think about the events that have made our world the way it is: the lessons should be so engaging and interactive that no child could ever find it boring. I tell my kids on the first day of school that by June, they will be describing themselves as ‘history buffs’, because we are going to spend the year finding things from the past and the world around us that fascinate them to the point where they won’t be able to learn enough. Then I’m proud of you for even bothering to read this page, because a lot of teachers don’t even try to step out of their comfort zones. Chances are, you hate social studies either because it’s boring to you and/or the kids (in which case, you’ll now have a ton of interesting activities to try) or you just don’t know anything about history and you’re uncomfortable teaching it. The good news is that you can TELL the kids this! I like to explain to my class that everyone has a subject (or two or three) that are harder for them than others, and mine is science. I tell them that we’ll be learning together, and that when they ask questions I don’t know the answer to, we’ll write them down and later go online or ask the science specialist to help us. No one is good at everything! Be honest with your kids. Choose a social studies read-aloud with lots of interesting tidbits about a subject you don’t know much about, and learn together. ABC books are great for this. For example, I know next to nothing about the Revolutionary War, especially since it’s not in our curriculum. However, the boys in my class always love to read about wars, and I want to encourage them to learn about things they love, so I got a book called ‘ABC’s of the Revolutionary War’. Each letter of the alphabet stands for one factoid, and we learn together about important people and things in the war during our daily read-aloud time. Afterward, we have a general idea of what life was like during the war–with no research on my part, no testing, and no worksheets. Just learning for the sake of learning. What a concept. You can find many more easy ways to integrate social studies concepts into your reading instruction on the Social Studies in Literacy Routines page. Teach what the kids want to learn!! Children are curious about the world around them and love to discover why things are the way they are. I encourage you to base your social studies instruction on current events and student interests as much as possible. Many teachers, myself included, have more freedom to teach what and how we want in social studies than in any other subject. I have state standards that students need to master, but I don’t have to use the (boring) textbook provided. In fact, my kids don’t even keep the texts in their desks because we only reference them a few times a year. Teach what YOU are passionate about! Even if you’re not a history enthusiast, there’s probably a time period or culture that has always fascinated you. Incorporate that interest through read-alouds and mini units. Your excitement will be contagious and the children will begin looking at history as a unique, individual passion, much like reading (we all have certain genres and authors that we enjoy). Teach with your strengths, and try new things. When you change the way you teach it, you change the way they learn it. Kids know when you enjoy talking about your topic. Look at your state standards. Chances are, elementary school children no longer have to memorize dates or identify random historical figures like we did when we were growing up. Now, students need to understand systems and cultures. This is your license to make instruction hands-on and engaging! The goal is to have kids DISCOVER history, not have it taught to them. This is easier than it sounds. Here are some great activities I learned (mostly from Social Studies Alive workshop) that you can use over and over with almost any historical event and time period in any grade level. Before introducing a historical event (such as a war, the slave trade, or the adventures of an early explorer), present the situation to students hypothetically. Have them close their eyes and imagine… or use photos (from the internet) and other artifacts to tell about the political climate or cultural environment of the time. What shapes history are the things that people were willing to fight for and change, so getting students to care about what their ancestors did is critical. Have students think or write independently about how they would have responded to a historical dilemma, and after they have gathered their thoughts, have them discuss in groups. For example, pose the scenario of the English (Pilgrims) who wanted religious freedom—what would students do? Try to overthrow the government? Make do with the situation and work within the system? Someone will eventually suggest finding a new place to live, and that’s when you can say, let’s find out what some people REALLY did 500 years ago. Put students in groups and give them three choices based on the discussion, and try to get the entire group to decide on one choice. Be sure to discuss how to respectfully agree or disagree. Groups could make a chart listing the reasons for their choice. While this may seem advanced for the elementary grades, remember that students don’t have to give realistic responses or think out all possible consequences: just getting them to THINK about their choices and those of people long ago is enough to get them engaged and thinking critically in a way that is developmentally appropriate. Create a word wall for the unit you are studying, and have students suggest words to add. This can be done traditionally on a wall, or in other ways, such as a file folder word bank. These file folders can be kept up for reference during your unit, then put in the writing center for students to continue to incorporate the vocabulary in their writing. Since art dates back tens of thousands of years, there is artwork for almost every time period and culture your students will study. Show children paintings and sculptures from your chosen time period and have kids make inferences about the culture. Even young children can draw conclusions about the popular styles of dress (and therefore climate and geography), hobbies and interests, and cultural values of ancient people just by looking at artwork. Art is a reflection of the time period and culture it is created in, so any introduction to art is an introduction to history. Check with your art teacher to find additional resources, videos, prints, activities, etc. Introducing new units, topics, or concepts with pictures can be extremely powerful. Type your subject into a search engine and click on ‘images’ to run a search just for pictures. Show students a FEW powerful images to elicit inferences about the time period or historical event shown. For example, you can show a photo from the 1950’s that has two store entrances, one for whites and one for ‘colored only’. Have students predict what those terms mean and what’s happening in the picture. Students can also write questions they have about the images. This is great to do as pre- and post-unit activities: after the unit, students can interact with the images to demonstrate what they have learned. 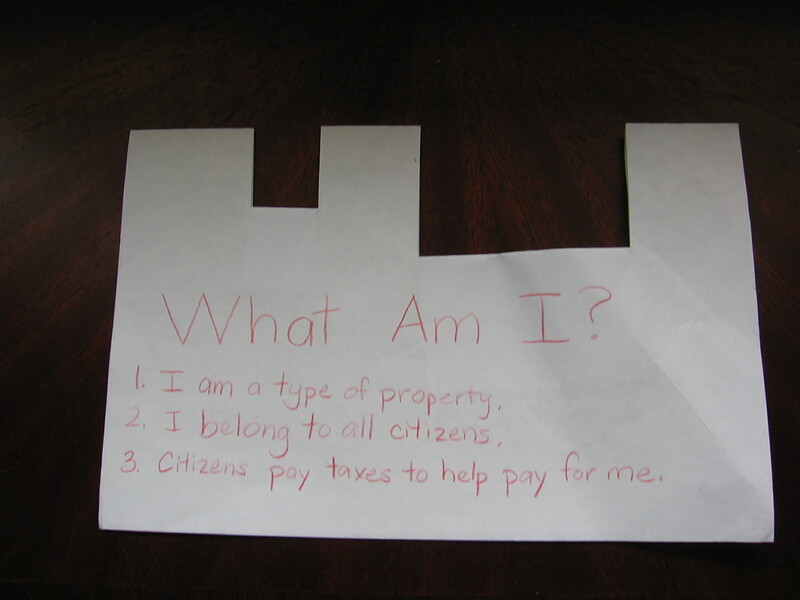 Create pop-up books for important vocabulary in the social studies units you teach. Each student can pick a term and create one page. Glue the pages together to create a book for your class library. The book can be a pop-up, as shown here. If your students aren’t developmentally ready to create skits, have them start with this activity. Show photos of statues and discuss where statues are placed. Then have children work together in groups to recreate a historical scene or event in the form of a statue. They can even create the corresponding plaque. See the photo below. Students love to re-enact history, so get them actively involved! One powerful example is a slave ship experiential exercise. Show students a diagram of the inside of a slave ship and discuss. Volunteers must then stand (or if you want to be more accurate, lie down) extremely close to one another. Yarn can be lightly wrapped around their wrists and ankles to represent the way slaves were chained to one another. Once students are in position, they must remain still and silent for 30-60 seconds. After going back to their seats, elicit their feelings, questions, and ideas about the Middle Passage. The follow-up discussion is critical in allowing students to process and make connections. An activity such as this can be disturbing but will help students understand the reality of slave transport and how abominable the slave trade really was. Another idea is to have pairs of students share a desk for a period of time, and give privileges and treats only to the ‘owner’ of the desk. Experiential exercises work well for other difficult concepts, too: help kids understand what life was like on the Oregon Trail by allowing them to keep only three items in their desk for the day and make do without everything else. To help them understand why wars begin, set up a game of tug-of-war in which the teams are grossly mismatched (i.e. 15 against 5) and discuss how unfairness can lead to conflict (such as the Revolutionary War). After completing a unit, reference your word wall/word bank (see idea #6) or have students generate an alphabetical list of important vocabulary words. Have each student choose a letter of the alphabet and a corresponding vocabulary word, and create a page explaining what the term means. The pages can be bound together in a class book. 10) I have…, Who has…? You may be familiar with this game for math facts, but it works well for any subject. Each child gets a card with an answer to one question and a new question for the next person. You start with the person whose card reads ‘START’. That person reads his question: “Who has…a piece of land that is surrounded by water on 3 sides?”. The person with the card that says ‘peninsula’ says, “I have peninsula. Who has…the continent that is also the name of a country?”. The person with ‘Australia’ would respond by reading her card, and so on. You can run an internet search to find ‘I Have…Who Has…’ games already created by other teachers, and after the kids have had some experience with the game, they can create their own. It’s a great review activity no matter how you incorporate it. Extension menus can be used for gifted students and fast finishers, or as center activities. Create extra activities for students to further their understanding of the concepts taught. Students can choose a set number of items to complete, or can be required to choose 3 in a tic-tac-toe pattern so that you can ensure they have a variety of activities. The book featured above has great social studies menus which help differentiate instruction. It’s actually a series so if you like the idea of menus, Laurie E. Westphal’s books cover lots of different subject areas and grade levels. Have students create postcards from the culture or time period they are studying. The postcard should be written as if the child actually lived at that time and is explaining daily life to a faraway friend. The postcard could mention recent activities, chores, weather, etc. You can provide students with a photocopied postcard outline and picture or have students create their own. The idea of a postcard is a bit difficult for young children, but with some concept development and modeling beforehand, it can be a great synthesis activity and provides a unique opportunity for writing practice. This is a great culminating activity. Have students collect or create ‘artifacts’ to represent a time period or historical person/event. Children must put a set number of items in a paper bag and pull them out one at a time, in a predetermined order, for the class to predict what event is being represented. For example, in an American History unit, a child could make a paper bag for Thomas Jefferson, and pull out a student-made replica of the Declaration of Independence, a picture of the plantation Jefferson lived on (printed from the internet), a foam #3 (for the 3rd president) from a puzzle; and a drawing of Jefferson. The rest of the class can write their guesses down after each item is pulled out, and discuss their answers at the end before the child reveals who the paper bag items represent. Choose items from a specific time period or culture (books, blueprints, photos, musical scores, paintings, etc.). Have students explore the artifacts and discover the time period through them. Donald Graves writes, “The objects eventually lead to people, and it is through the eyes of these people that the time period is understood”. This could be done gradually, with students exploring one new artifact each day and slowly making connections between the items to draw inferences about the culture. This approach makes history concrete and can be adapted to fit your teaching style and strengths: students could pretend to be archaeologists and dig for the artifacts in a sand table, you could dress up like a detective and make a big show of pulling the artifact out of a special container, students could catalog the items in journals or do group discoveries. The possibilities are endless! This technique is also from Donald Graves. Either you or a special visitor presents an object relevant to the curriculum. No explanation is given, but students can ask as many questions as they want. This works especially well for items for which student have little background information because they must actively construct knowledge. After the questioning session, ask “When did the session become interesting to you? Which question(s) brought the most information?”. Donald Graves suggest having students bring in objects as well and experience the process from the other side. Sequential questioning teaches children that being able to ask questions can be just as powerful as being able to give answers. “I’m not satisfied until my students fall in love with history. I love the idea of googling images to start (or continue) a unit in social studies. Pictures and photos can capture so much about emotion and urgency that “dry” social studies texts might miss. And a captivating photo can really give a sense of purpose to their learning. Thanks so much! This is a great introduction to DI ideas in SS. I am moving up to 6th grade middle school and am excited to implement these ideas into my curriculum! Thanks for sharing! you are definitely bookmarked! Great ideas! LOVE the postcards!! I really like the ideas about the post cards from a time period. There are some good hands-on activities that I can develop for my Social Studies classes. Anything for high school/early college students? Everything I research seems to be for the very young. Hmm. I don’t know of anything offhand. I’ll post back here if I come across any resources! Check TeachersPayTeachers.com, too. There’s some great stuff there. You are awesome! Thanks for the creativity. Thank you for the fabulous ideas! My first time teaching 6th grade anything and needed some suggestions. Just curious, on the bottom of the page you mention Mrs. Newington and a link to her website. I clicked on both links and they are not working, but I would love to see some of her stuff! Any way you can redirect me to her site? This page is BRILLIANT! Thank you so much for sharing. Very helpful. Great ideas Angela! Thank you so much for sharing. You are an inspiration. Please keep sharing. It is very much appreciated! Thank you! Great ideas and great explanations! I am in a science unit with my 5th graders. We are on the interaction of the spheres unit, but are on the section that is about caring for the environment. I’m using videos, articles, etc. But what is something I can do that gets them discussing it? Something kind of like a project, but not that long to do. Something they could work on within groups and then be encouraged to discuss. I think I am going to have them to draw each other’s foot tomorrow. ( We have talked about the impact of “human footprints”) Then maybe use that to write certain ideas about this topic? Is this too young of an activity for 5th graders? Why should we tell kids we don’t like it? This is not a good thing. The reason is that too much honesty does not work. I like teaching everything I teach because what I like is teaching. Social studies is so much more than cute projects. It is life itself. We all teach to make kind people. This is where that happens! I wouldn’t tell kids I hate a subject and never use it in real life. I WOULD tell them that I’m not naturally good at certain subjects and have had to put forth more effort to connect to those subjects and do well in them. I think you’re the first person I’ve heard of who likes EVERYTHING they teach! Most people (teachers and kids alike) are more drawn to certain subjects than others. I’m a homeschool mom, and these ideas are brilliant. I get stuck for ideas on how to teach, not on what to teach. Or maybe I get stuck in a rut. Thank you! I’ve shared your website to our homeschool group of families, singing your praises! !